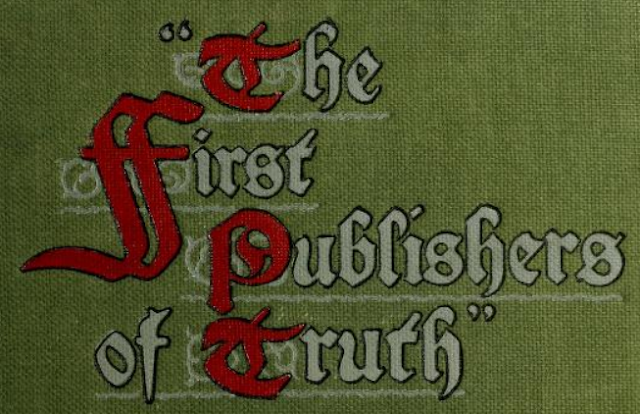 Detail of cover of The First Publishers of Truth: Being early records (now first printed) of the introduction of Quakerism into the counties of England and Wales. Source. The call-in advice show of Radio Yerevan (a legendary template of Soviet-era jokes) received this question: "Can you recommend an eye-and-ear doctor?" Announcer: "Do you mean an eye doctor? Or perhaps an ear-nose-throat doctor?" Caller: "No. My problem is what I see doesn't match what I hear." What I "hear" as an ordinary U.S. citizen is that we live in a constitutional democracy, a republic of the people, by the people, for the people, with remedies for corruption and abuse of power by even the highest officials in the land. What I "see" is quite different: conflicts of interest on every hand, from Cabinet appointments to the emoluments debate; a string of indictments and convictions of presidential associates; capricious decisions; constant lies; peremptory demands, including that stupid wall; petty and vulgar personal attacks; outrageous mismanagement of refugee assessment and border control (including new revelations of children being separated from parents); utter lack of transparency in U.S.-Russian relationships; irrational, contradictory, and bizarre pronouncements about Obama, Iran, Turkey, Syria, Afghanistan, coal power, trafficking in women, the danger posed by immigrants; ... the list of flagrant violations seems endless. In making his case that the U.S. House of Representatives should impeach the president, Atlantic Ideas editor Yoni Appelbaum carefully argues that impeachment is a calm and rational response to Trump's off-the-rails presidency. It's not an extreme, apocalyptic, risky step for Congress to take. Instead, it would channel the wild, divisive argumentation we see everywhere now, fueled by slashing social-media campaigns, and potentially reduces this bitter torrent to the disciplines required by the very process of impeachment: an actual application of the Constitutional filter of "Treason, Bribery, or other high Crimes and Misdemeanors." The urgent case for impeachment, from Appelbaum's point of view, is that it would be far less destructive and far more orderly than what is already happening. The fight over whether Trump should be removed from office is already raging, and distorting everything it touches. Activists are radicalizing in opposition to a president they regard as dangerous. Within the government, unelected bureaucrats who believe the president is acting unlawfully are disregarding his orders, or working to subvert his agenda. By denying the debate its proper outlet, Congress has succeeded only in intensifying its pressures. And by declining to tackle the question head-on, it has deprived itself of its primary means of reining in the chief executive. Each day that impeachment is postponed is another day where the gap grows wider between what I've always heard -- we're a democracy, we have equal justice before law, we resist corruption and tyranny -- and the brazen violations we see all around us, and to which we're daily becoming habituated. Personally, I've found Yoni Appelbaum's advocacy for impeachment more persuasive than I might have expected. In part this might be because we're reaching some kind of crescendo in the shambles Trump is making of our country and its reputation worldwide. But I'm also sensing a growing spiritual urgency that relates to a word that's been sacred to generations of Quakers: Truth. 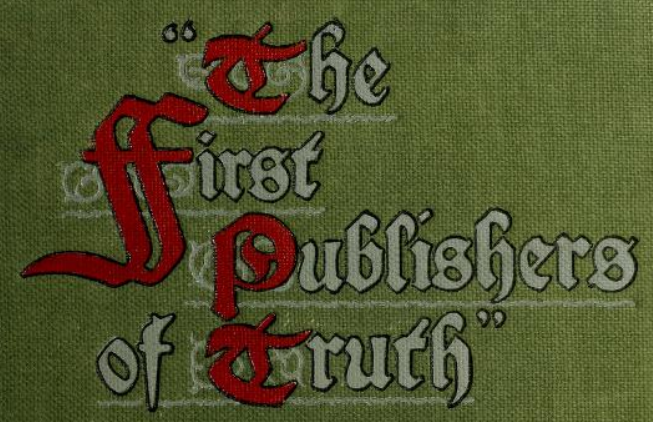 Students of authoritarianism repeatedly caution us that the royal road to dictatorship involves detaching us from any connection with truth. (Example.) It's not that authoritarians deliver a set of different interpretations of the same data, or different philosophies or policies. They want to set aside our common search for good policy (within which search decent people can differ), in favor of such a blizzard of lies that we must rely on their confident, authoritative Voice to lead the way. If we catch them in a lie, they can say, "Oops, here's another version, but your guys lie, too." And those who stubbornly insist on verifiable truth will eventually find themselves in a direct confrontation with those who put their trust in the Voice. Those Voice cultists may be in a minority, but too many of the rest of us may be tempted to avoid the confrontation, or postpone the day of reckoning. Impeachment makes the confrontation real, honest, direct. Passivity does not provide an escape. In our search for truth, we also reject any temptation to paint Trump as even worse than he really is. It is quite true that Donald Trump correctly identifies some huge gaps in American policy. His cloud of lies and racist innuendos concerning immigration and border control gains currency precisely because earlier politicians have utterly failed to put together a humane and balanced approach. His manipulations throw trash into a vacuum that he did not create. Quaker cartoonist Signe Wilkinson, from January 2013. Source. Similarly, he questions American imperial conventional wisdom at some crucial points. To what extent is the USA's "indispensable nation" status in the post-World War II global configuration, and our 800 overseas military posts, serving our actual values, rather than the interests of the military-industrial complex or the convenience of other nations who rely on us to preserve international order while serving as their rhetorical pincushion? There's nothing inherently wrong with an iconoclastic president who questions conventional wisdom. I can't help fantasizing how an independent-minded leader with intelligence and soul could gather the intellectual and spiritual resources of this country to examine both the strengths and the pitfalls of American exceptionalism. For many of us, Obama approached that ideal, despite his apparent need to reassure the elites by (maybe) overcompensating for his unconventional origins. His speeches (Nobel Prize speech; Cairo speech; prayer breakfast) revealed an ability to reflect on these nuances. However, the Congress, with the opposition party committed to its "party of no" stance, was rarely able to provide him a bipartisan forum to debate these questions and seek a reasonable balance. In any case, Trump is manifestly incapable of engaging in searching dialogues with diverse voices, even on topics where he has correctly identified inconsistencies in American policy. These inconsistencies need solutions, but nothing Trump has done tells us that he's qualified to address them ... or do more with them than simply use them to rally his base against his opponents. We are not excused from the requirement to pray for the president. I do pray for him daily -- for him and for his early retirement. Impeachment is the most orderly, honest, and direct way toward that goal. This is my 800th blog post. I wish it could be more inspirational. However, by speaking so directly to the need to begin the impeachment of Trump, I hope I've carved out the freedom to write about other things in the next weeks. I had hoped to start discussing the fascinating responses I received to the "trustworthy church" survey; and I also want to return to my long-time theme of Friends worship in future weeks. Another theme in the pipeline: what are the stakes in the recent Eastern Orthodox schism? Today's sudden substitution of this impeachment theme was prompted by the events dominating American politics these last couple of days -- not in the service of alarm and outrage, but in the spirit of a specific form of discipleship: reducing that gap between what we've heard and what we see. Friends Journal and the cautious hope of a racially diverse Society of Friends. On welcoming broken missionaries back. The church dare not, dare not, pray for the unengaged to be engaged while in the same breath refuse to face the tragedy that will come with that engagement. This is dangerous and irresponsible, if the church is not prepared to deal with the consequences. Ted Grimsrud's Civil War question: Can one hate both slavery and war equally? Open Culture: Infographic on American global military deployment. Mary Oliver broke Tim Brown's heart. "Some people ask me, 'what does a stranger do?'" As I think you indicate early in your article, the problems in our society are very broad. They don't stem from any single individual. Impeaching Trump wouldn't eliminate or even substantially alleviate the many ills in our society you note. It would not address the causes of our problems at all. It would heighten some of the problems. And he would not be removed from office, so we still have the harm he will cause. In the highly improbably situation that he was removed, we would get Pence as President - an extreme ideologue whose disrespect for the truth is demonstrated by his slavish repetition of Trump's lies. I am not convinced impeachment would do this country any good. I appreciate this post , not so much for the call to impeachment but for the plea for a rational examination of the issues and concerns raised. I am not convinced that any "Truth" will be uncovered but possibly a very clear, public, and "constitutional" analysis of the "untruths" and "mistruths" of high ranking officials, including a number of administrative and legislative members who seem to accept and use the practice of the President. I certainly think rational examination of issues and concerns would be a good idea. I don't think impeachment is very likely to result in that. It doesn't appear that there would be more than a handful of members of Congress that would be interested in rational examination. Thank you both for commenting! What did you think of Appelbaum's list of benefits of impeachment in the case that it did not result in conviction? My own hope is that if a bill of impeachment were passed, with a dispassionate listing of crimes and misdemeanors, the Senate, by failing to convict, would essentially go on record as saying that this enumerated list of violations is tolerable. The public would then have the task of deciding whether such senators deserve re-election. It's a risky strategy, but we're now surrounded by nothing but risks. Is it your intent to suggest that, because a list of crimes is dispassionate any body that fails to be informed by the list, by necessity is in essence tolerating the alledged crimes? Could it be possible that the body has determined list of crimes does not reflect truth? Keith -- thanks for asking for the clarification. To me, making a list dispassionately means only listing "crimes and misdemeanors" for which conviction by the Senate is a reasonable possibility. It requires distinguishing actual misdemeanors from gossip, overheated rhetoric, and jaundiced interpretations. Ideally the Senate would behave in the capacity of an honest jury and convict, or fail to convict, based on a fair evaluation of the House's case. If their decision, however, seems (to fair-minded audiences) to be based more on political loyalties, then their suitability for office might come into question. Some have argued against impeachment on the basis that it would be a useless exercise, because too many Republicans would simply refuse to convict a president of their own party, no matter how persuasive the evidence. Appelbaum argues that even if that were true, the discipline of impeachment as a process would have been worthwhile and instructive. In addition, the Andrew Johnson case study showed that, in response to the impeachment charges, Johnson modified his behavior, even though the case didn't ultimately result in removal. Are you able to lay down a dispassionate list of the President's crimes and misdemeanors that you can reasonably anticipate the senate would convict thereby? Keith: In Appelbaum's article, the paragraph beginning "The oath of office is a president’s promise to subordinate his private desires to the public interest..." and the three following paragraphs outline what such a list might include. I have re-read the political opinion you have deferred to reflected in Applebaum's article with particular focus on the three paragraphs you are guided and informed by. I have also read the various political opinion pieces (easily called up on any search engine) not in agreement with the opinion to which you have deferred. With that said, I will ask you somewhat that same question I asked earlier. Is it your intent to suggest that those who do not identifiy and agree with the outward political opinion of the persons you are guided and informed by are not being dispassionate and tolerate the reflections those you are guided and informed by place over against other people? To be more specific I am not interested in the opinions of those political leaders you are guided and informed by. I am interested in what you personal opinion on the matter is? Personally, I can testify to you that, through the immedite and direct presence of Jesus Christ in my conscience, I have come out of the process of identification with and participation in outward political opinion to guide and inform how I relate to other people. Truly, there is a different way of being and consciousness, through direct and unmediated inshining immanent Presence in our conscience and consciousness wherein we come out of the process of being guided and informed by outward polticial, religious, and social, opinion, insitutions, and leaders to inform our relations with others. In this way we are come out of the contention and strife that is of the nature of a conscience and consciousness guided and informed by outward political, relgious, and social intellectual constructs and institutions. Thanks again, Keith. I don't have any personal leading that contradicts my essential agreement with Appelbaum's arguments. I'm ready to unite with the author's opinions. It doesn't bother me that I didn't arrive at them independently, since they're part of the common pool of ideas to which many people have contributed. I'm as entitled as anyone to draw from that pool rather than feeling bound to remain detached until I receive a direct revelation. I understand you may differ with that viewpoint. It also doesn't bother me that these opinions can be labeled "political." The word "politics" means a public process of stewardship of scarce resources. As a disciple, my participation in politics is guided by my values and by the discipline of being in a mutually accountable relationship with other disciples. I don't agree with almost all of my Russian friends that politics is a dirty business. I hope that you can understand why I come to the present crisis with an approach that is different from yours, even as I'm grateful that you are persistent in advocating the way you've chosen. Hello again Johan. Thank you for this edifying and pleasant conversation. Yes, you and I are of a different conscience and consciousness. I suspected it was the case, however, in light of your most recent response, it is clear. I have spent some time at various political rallies around the country and have shared the way of a conscience guided by and a consciousness anchored in the immediate and immanent presence of the inshining Light of Jesus Christ to guide and inform human relationships and interactions without regard for outward political, religious, and social ethical and intellectual constructs and the institutions and leaders that promote and profess them. I do understand a conscience guided by and a consciousness anchored in outward political, religious, and social forms, traditions, constructs, and contrivances. Such is the way of most people today. Although they may not identify with and participate in the same same outward formal and intellectual structures, they all share, value, and are married to the process of identification with and participation in outward formal structures the guide and inform their relationships and interactions with others. It is this process that nurtures and breeds conflict and strife. That is the way of it. I suggest and recommend to you, that to the extent you engage in this process, you do not only run the risk of conflict and strife, you nurture it and breed further conflict. It is of the very nature of a conscience guided by and a consciousness anchored in outward ethical constructs to guide human interaction and relationships that nurtures conflict in human relationships and interactions. There is a way of peace, it is through waiting upon the inward motion and impulse of inshining immanent Presence itself in itself in our conscience and consciousness to rule and guide our relationships. Through this inshining impulse it is discovered to us a different way that is come out of conflict and strife to guide and inform relationships and interactions. Again, this is by way of recommendation to your conscience.